Once again, our annual letter has gone out, requesting donations to help support our efforts to deal with invasive Phragmites. Again, replies and donations are coming in. 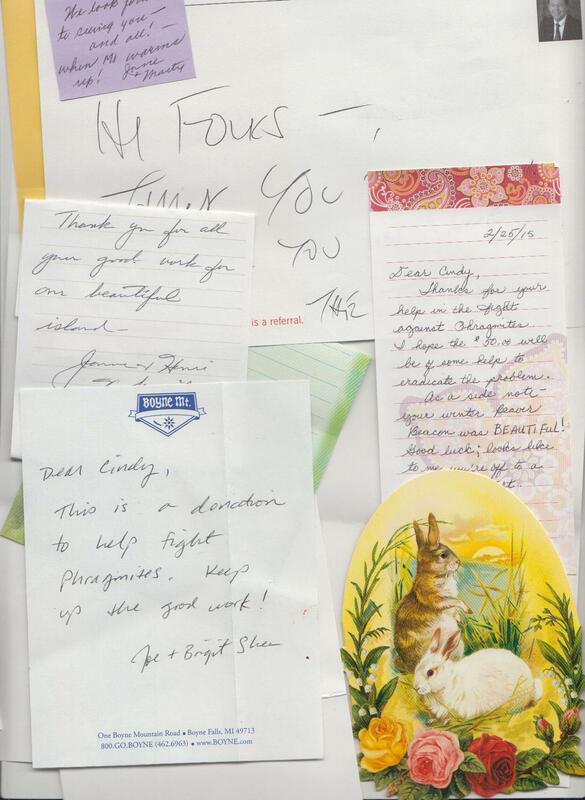 Again, they arrive with sweet notes, good wishes and encouragement. Once again I am left nearly speechless, amazed at the kindness and generosity and support. After two days of tri-folding letters and stuffing envelopes, answering Emails, writing letters and writing and editing about a million words for twenty different articles, I was all ready to call it a night. I had eaten my little bowl of buttered noodles and poured a big glass of red wine. I was headed for the couch. I wasn’t going to write another word tonight. One last check of my Email…one unopened letter. The title: Goats. I knew what this was about. “Don’t open it!” my tired self advised…but I opened it anyway. So, here I am, in the middle of the night, at the desk. 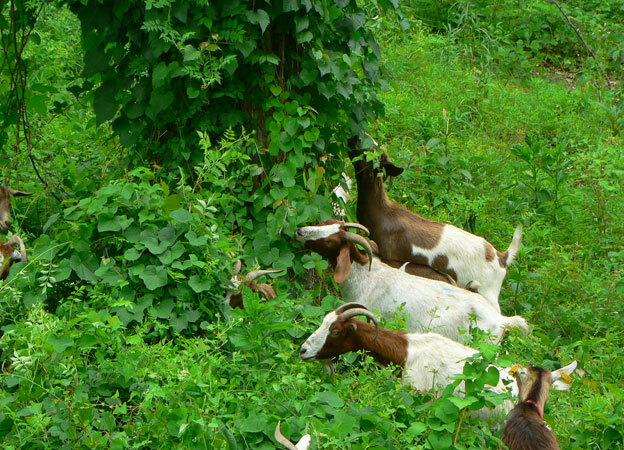 Goats are an outstanding biological weapon against invasive plants. They eat Oriental Bittersweet. They eat Poison Ivy. They eat Phragmites. They eat Kudzu, for heaven’s sake! We can’t use goats here. Though they are a valuable, non-chemical helper in areas where invasive plants have totally taken over, the fact is, GOATS EAT EVERYTHING! Goats will eat a sheet from the clothesline…or the clothesline itself. Goats will eat a tin can. Goats will eat Phragmites…and every single tender plant that grows near it, too. They would eat our Spring Beauties and our Dutchman’s Britches (both protected species). They would eat our Princess Pine (endangered). They would eat our precious Michigan Monkey Flower, of which Beaver Island hosts 20% of what is growing wild on the entire planet! I wish we could do this without chemicals. We all do. Everyone wishes there were a better way. Though many people much smarter than I am are working on it, at this time we are applying the most proven, safest method of keeping our fragile eco-system intact. Thank you for the information, but as for Beaver Island…NO GOATS. After two days when weather and transportation woes kept us away from our task, last Thursday was a godsend. The lake was calm, the day was cool but mild, and transportation was arranged. On this day, it was just the three contractors: Pam Hilton, Marc Seelye and Christine Miller…and me. I’d been scheduled to work at another job, but decided last minute that I’d like to get the “full experience,” and rearranged things to make it possible. Having an even number of workers (even one as barely competent as myself) allows for splitting up and thus covering more territory. 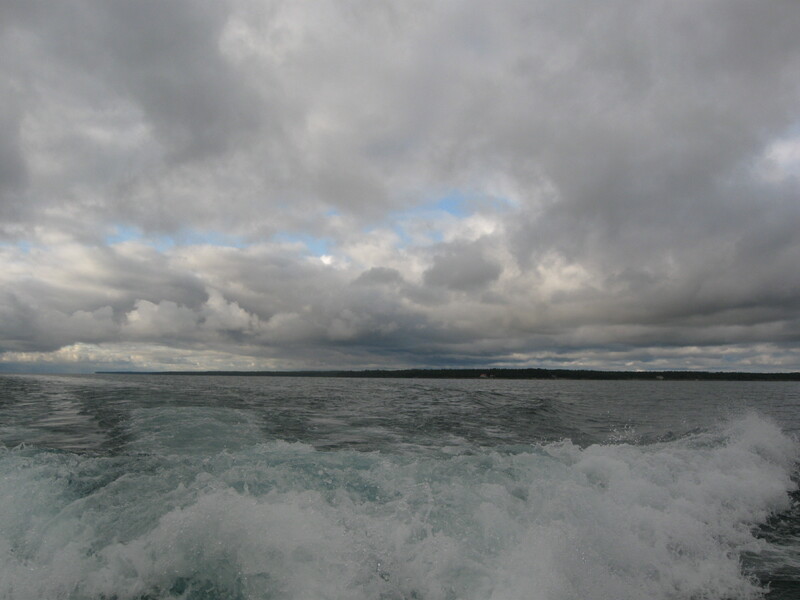 As we set out for Whiskey Island, a narrow band of baby blue sky met the steel gray waves at the horizon. Above that, a narrow ribbon of white clouds divided that bit of sky from the ceiling of heavy gray clouds that blocked the sun and were our almost constant companion that day. When I took a photograph, my camera beeped, but I couldn’t see what was wrong. When we got to Whiskey Island – another island I had never before visited – I took another. Again the beep. There, I could read the screen: “NO MEMORY CARD”. UGH! In the interim days of rain, I had taken my camera out to photograph the many varieties of Fall mushrooms that were popping up all over my yard and down the Fox Lake Road. I’d taken the memory card out to download those photos onto my computer…and never put it back. What a disappointment! Whiskey Island Is small – about 130 acres – and shaped like a kite. It sits to the north and west of Beaver Island, and is roughly halfway between Garden and High, the other two islands we visited. We split into two groups, with one person handling the herbicidal treatment while the other took GPS coordinates and notes. We set off in opposite directions, to walk the perimeter of the island. Christine and I headed out together. The shore was covered with acorn-sized gravel on a steep incline. 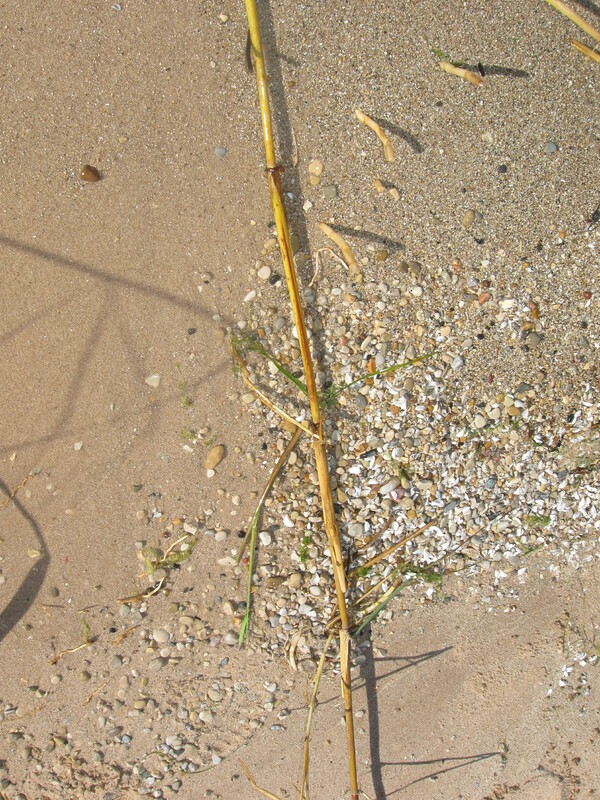 Sand cherries grew right up to the water line and spread their branches out over the water. Within the first minute, we realized the only way we were going to be able to walk the shoreline was to walk in knee-deep water. It was cold! Within ten minutes, my feet were numb. By the time we made it around the island and met Marc and Pam, it felt like I was lifting heavy logs each time I took a step. We zig-zagged from the waterline through the shrubbery to the higher dunes, to make sure we weren’t missing anything. 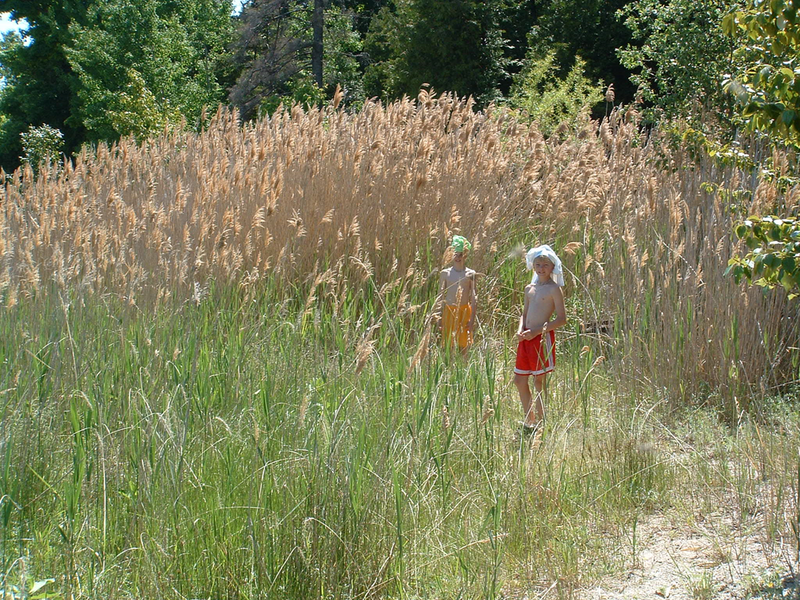 We came upon a small stand of native Phragmites, with the characteristic bronze stalks. In that case, we make note of the location, but do not treat the plant. Healthy stands of native Phragmites and other native plants help to keep invasives from moving in to an area, and should be left alone. We also found one small stand of invasive Phragmites, evident by its more aggressive growth pattern, large, dark, raggedy seed heads and straw-colored stalks. We noted the coordinates, and treated it with herbicide. 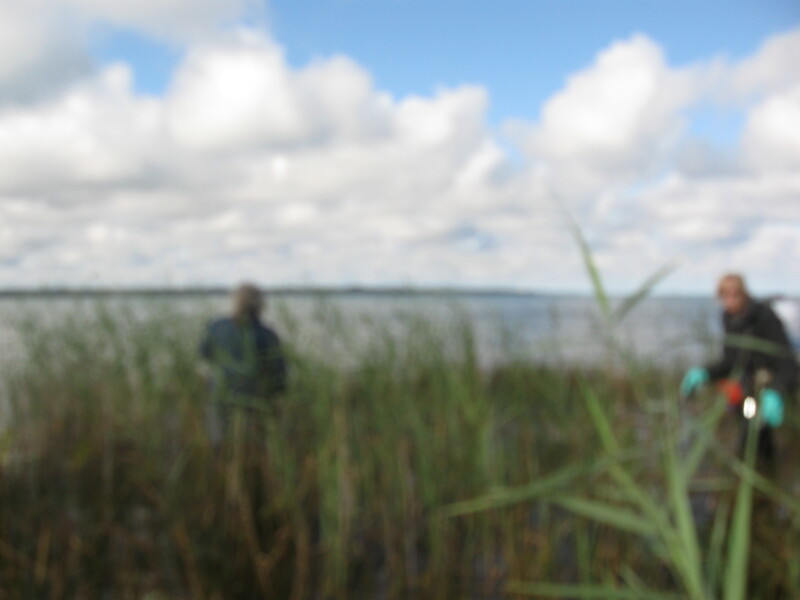 We met Pam and Marc coming from the other direction.They, too, had found just a couple small stands of Phragmites. After the many large stands we had encountered on High Island, this was very good news! We had walked the perimeter in just about an hour. The boat was waiting for us. Next, back to High Island, to get what we had missed there. We had found High Island to be much worse than expected, based on prior treatment there. Each team had run into issues that had prevented them from completing treatment in the time we had. The herbicide cannot be applied after four PM; we were limited to the amount of herbicide that we could carry on our backs and we were traveling through very rough and sometimes impassible terrain. Each team had carefully noted the size and location of every untreated stand, as well as specific issues (like thigh-deep muck that was impossible to walk through) that made treatment tricky. If we hadn’t been able to return there until next year, we would have known, at least, to make those areas a priority. We set out again in teams of two. Christine and I started at what had been our finish point on Monday, and back-tracked through the same section of shoreline, finding and treating each stand we had missed. Pam and Marc had their own sets of coordinates, with areas to treat in the other direction. By two PM we had wrapped up treatment on another island! We set off for Garden Island. We had, on Saturday, divided into two teams of three, and headed out in opposite directions on Garden Island. We had to meet back at our starting location at four o’clock, so had to allow time for the return. Because my group walked the trail through the island, we had a bit of time to spare (and Pam Hilton does not like to waste any time!) but we hadn’t known how long it would take us. Both groups had clearly recorded their stopping point, so we knew exactly where to begin. We expected to find a couple small stands that had been noted and treated in previous years. When we’d left Garden Island on Saturday, we had agreed that it wouldn’t be the worst disaster if they had to wait until next year. With so many variables of wind and weather that are out of our control, that is always a possibility. We found and treated the Phragmites we expected. Then, in the last little section before the end of our trek, we found more. From deep in the center of a huge stand of cattails, we saw the distinctive brown seed heads of invasive Phragmites, towering over the surrounding growth. The stand was right in the center of an acre or more of cattails, with dimensions of about 50′ x 50′. It was probably growing there last year, but not visible in that location. This year, it had gotten tall enough to spot. Christine and Marc waded in. Pam and I – each barely five-foot tall – stayed back. We quickly lost sight of them, in the tall reeds, but we could hear them. Exclamations and splashes and the occasional cuss word kept us apprised of their location and activities. 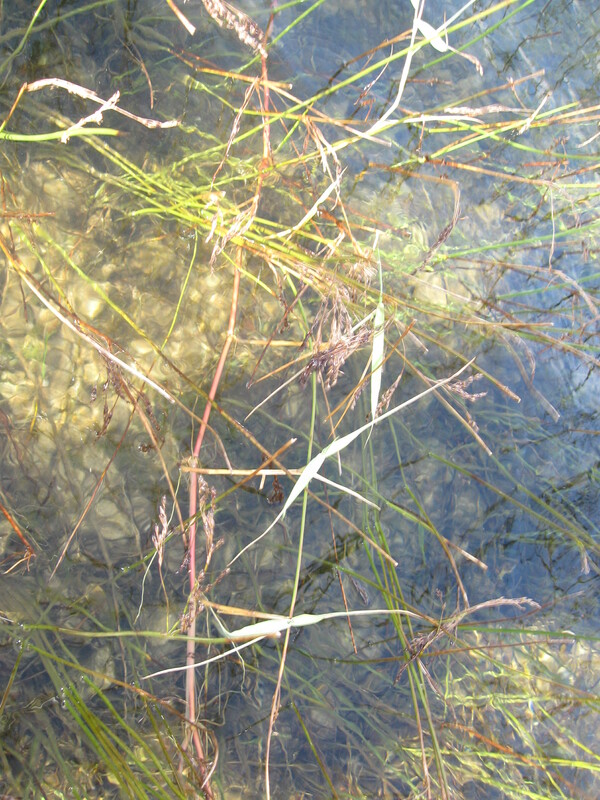 They were in cold water to their waists, with twenty-foot tall Phragmites surrounding them, with the additional complications of heavy backpacks, rubber gloves and heavy, sodden clothes and shoes. At one point, Marc stepped in a hole that brought the cold water up past his chest. When they finally came out of there, Christine stopped to dump a minnow out of her shoe! It was a long day, but a good one! With the completion of Garden Island, every bit of shoreline on the outer islands that we had scheduled for treatment this year was accomplished! I think I’ve said it before, but it’s well worth repeating: These folks really earn their pay! Many thanks to the crew at Pam’s Invasive Plant Management LLC for your professional and thorough work here, and for allowing me to experience it firsthand! 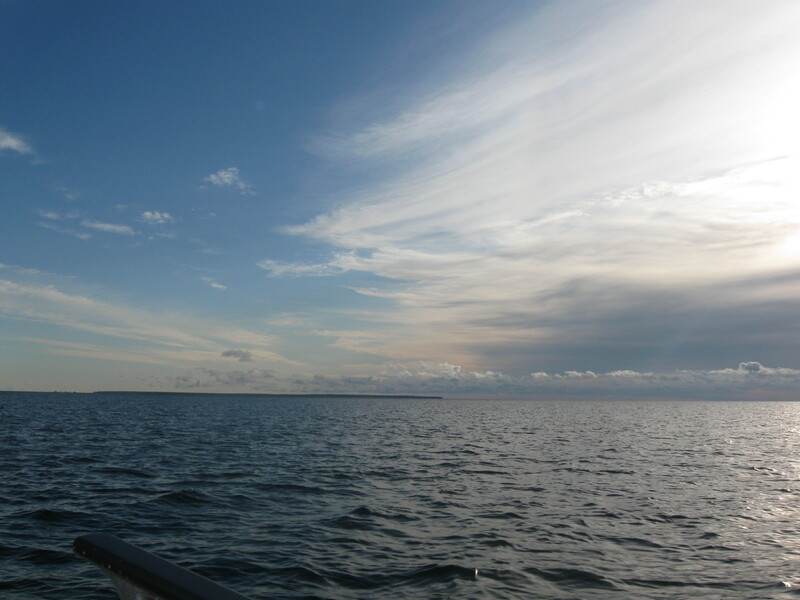 Winds kept us off Lake Michigan and away from our task on Sunday, but Monday dawned with warm sunshine and calm waters. 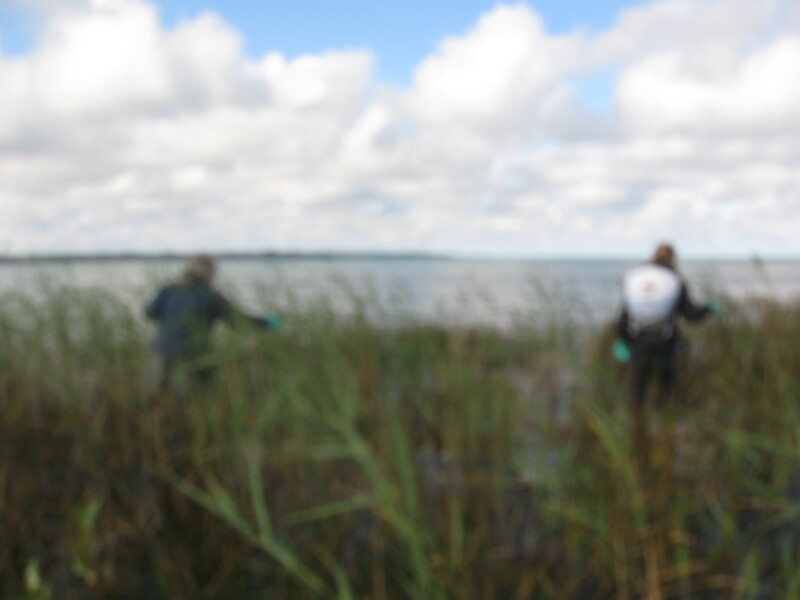 We set out to treat invasive Phragmites on High Island. 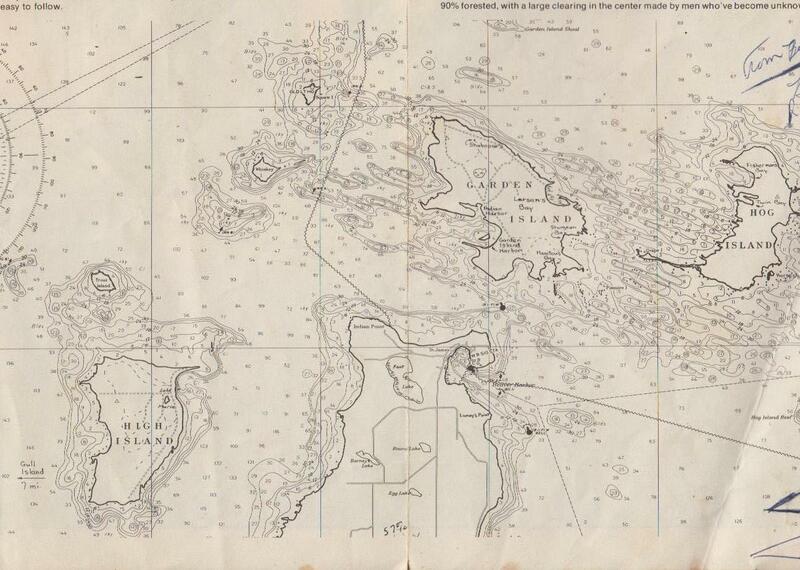 As you can see on this map, High Island sits on the west side of Beaver Island (that’s the top portion of Beaver Island in the lower center), and is a much greater distance to travel from our good harbor, than it was to Garden Island the other day. Weather is always a concern on the great lakes. Last year – and possibly the year before that, too – the treatment on this island was not completed due to inclement weather and travel concerns. We wanted to be sure to attend to it this year..
Dave Blanchard, who had helped us on Garden Island, couldn’t make this trip. Stan Eagle agreed to come along. We divided into three groups of two: one to handle the herbicide application; the other to document the location (per GPS readings) and size of each stand of invasive Phragmites. We set off in various directions with instructions on where and when to meet for our return trip. Christine and I came upon several areas where the invasive reed had been successfully treated, where the dead stalks had been sheared off by the ice. Unfortunately, we also noticed areas where this tenacious plant was sending out new growth. 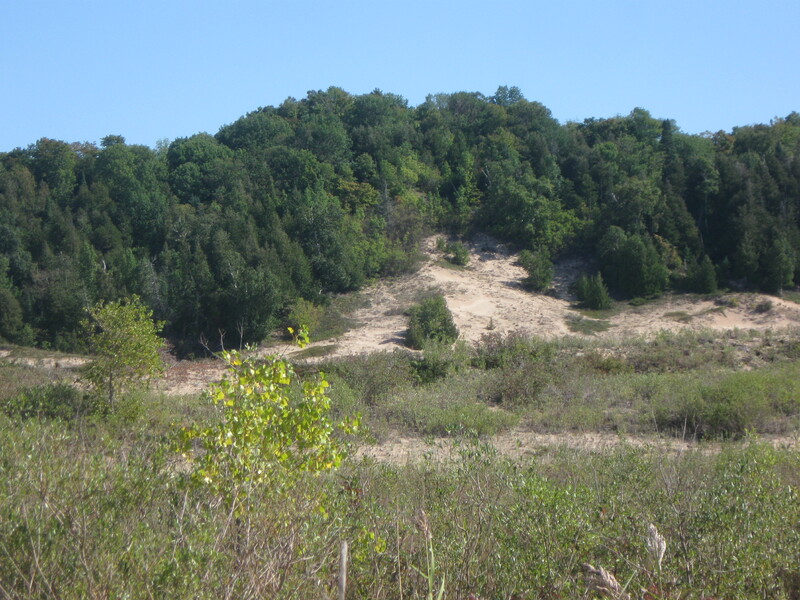 …and areas that had not been treated in recent years where it threatened to take over. and runners shooting out over the sand. while I took pictures, documented locations, assisted where I could, and mainly tried not to slow down the operation! 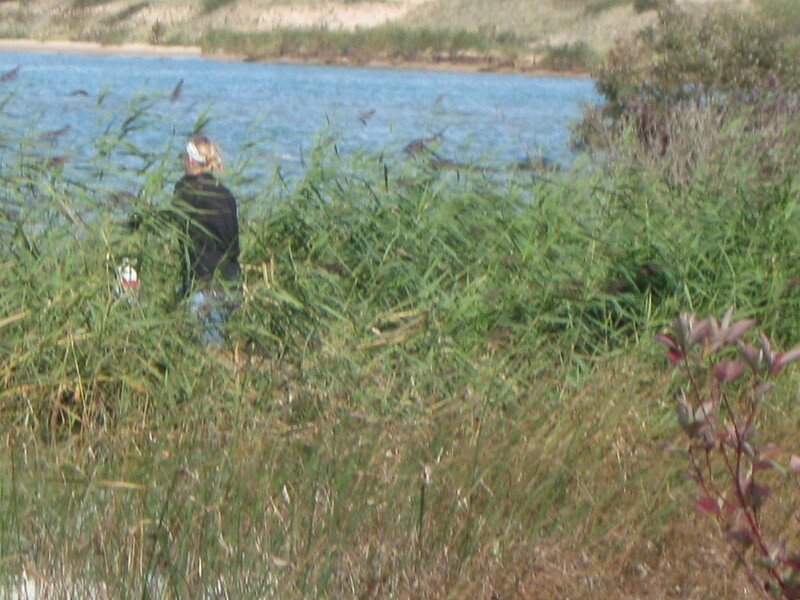 One dense stand of Phragmites was 160′ long, and extended in from the shoreline at least 40 feet! Another band was estimated at thirty feet wide, but scattered stalks stretched inland almost two hundred feet. One stand was so dense, the stalks (20′ or more in height!) were actually holding Christine up in the water (which was still to her waist!) as she applied the herbicide. 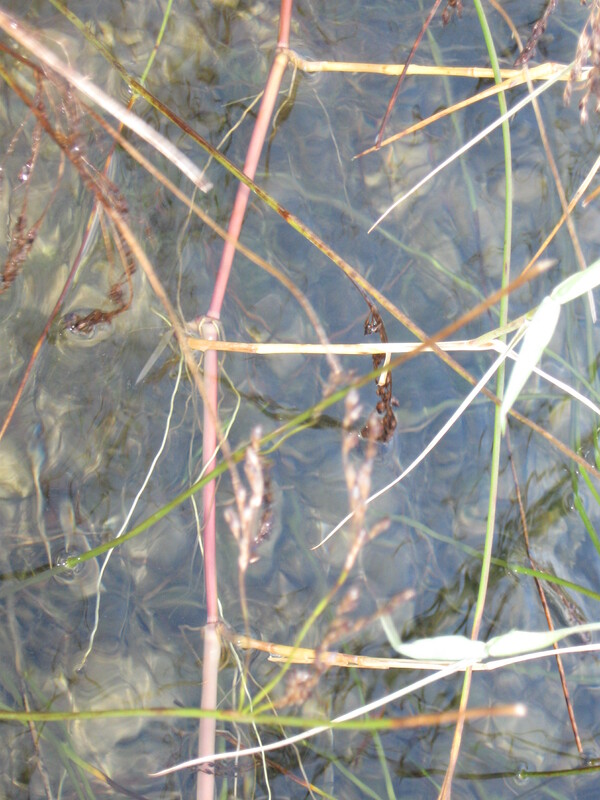 She noted that minnows, trying to swim away from her, were trapped by the tangle of thick growth. It was quite overwhelming, and reaffirmed everything I have learned about the necessity of keeping this plant under control. Every now and then, I just had to remind myself to pause, breathe, and pay attention to the beautiful surrounding. That’s what we’re working to save, after all. Although I’ve been working as Phragmites Administrator for a year, I’ve had little firsthand experience with the plant or its treatment. Oh, I can identify Phragmites. I can distinguish between the native plant and the invasive species. I’ve been learning a lot about its growth, spread and habits, and the many ways scientists and conservationists are working to keep it under control. I’ve seen some pretty frightening photographs of areas where Phragmites has run rampant. I’ve gone through the records of our treatment here on Beaver Island and the smaller surrounding islands in this archipelago. My contribution, though, has been mostly in the form of paperwork and reports. Unable to find transportation to the outer islands on the weekend, Jeff Powers generously offered, and then rearranged his hardware and veterinary schedule in order to take us out and pick us up. Our contractors, Pam Hilton, Marc Seelye and Christine Miller had been up early, planning and preparing. Several heavy totes and containers had to be loaded onto the boat. A bit of training, safety instructions, waivers and permission slips circulated. It was a blustery day, cool but also beautiful. I had never been to any of the outer islands before, so was looking forward to the experience…while at the same time dreading the possibility that I would look (or be!) incompetent, incapable or in-the way! We came to Garden Island after a brisk boat ride, and lowered the small boat. The gear was transferred, and Marc paddled equipment and crew in to Northcutt Harbor in two trips. Jeff headed back to Beaver Island, to continue his busy day. We divided into two teams and went off in opposite directions, following the shoreline with plans to meet back at this location at a specified time, to be ready to go when our ride returned. One member of each team took GPS readings and recorded the coordinates for each stand of invasive Phragmites we found. It was noted how large the area was, and graded: scattered, patchy or dense. The other two members were responsible for herbicidal treatment. The water level is up this year. We were often walking in the cold water in order to follow the shore. The ground was covered with irregular and sometimes slippery rocks. It’s evident that our treatment is helping. Areas that had been treated last year were always smaller stands, and graded “scattered” or “patchy.” When we came to Indian Point, which had not been treated last year (weather conditions made travel impossible), we came upon a massive stand (I think they approximated it at 80′ x 100′! )of the invasive plant. 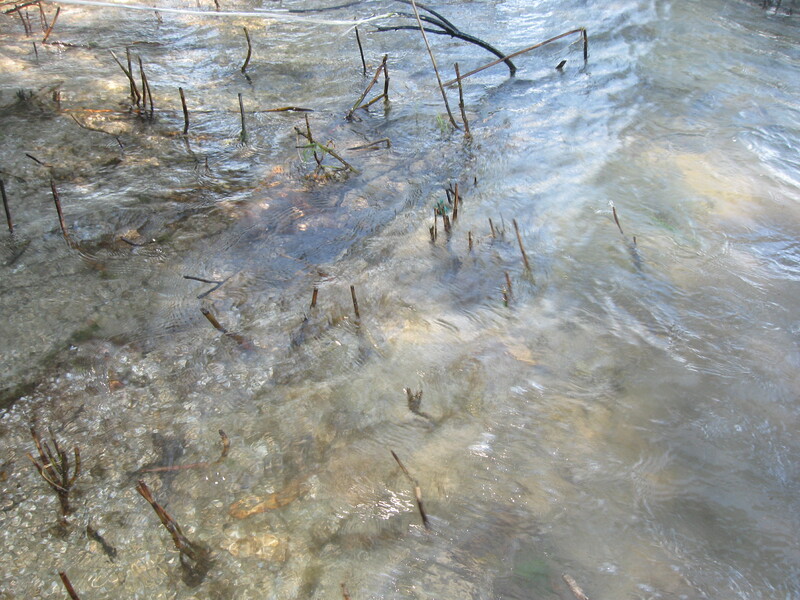 We noted many long runners trailing through the water, with dangling roots and leafy vertical starts every few inches. The stand was so dense, it was difficult to gauge where I’d been, and where I needed to be. We were sloshing through deep water with a mucky bottom, and filled with runners ready to catch us up. You may note that in addition to the protective clothing and rubber gloves that make all movement more difficult, a strong wind came up off the water, making it necessary to work backward toward the shoreline, to avoid the wind carrying the herbicide. 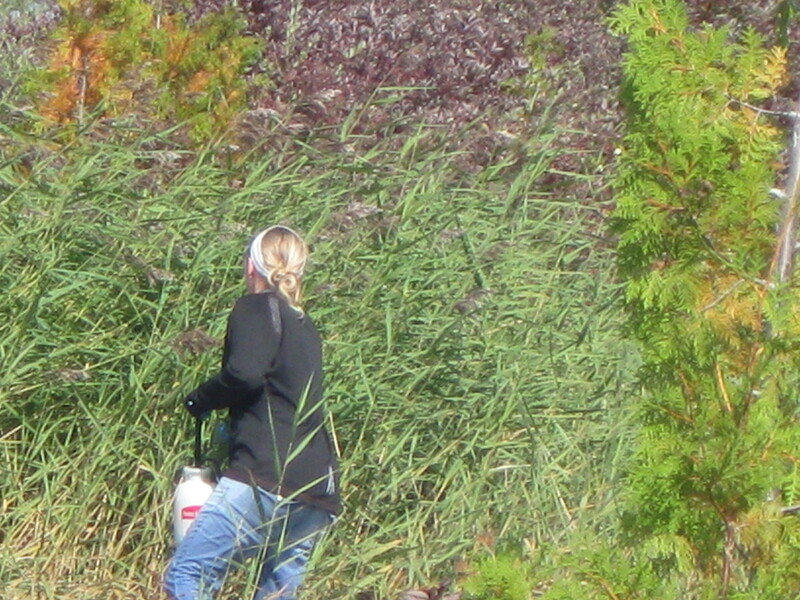 Through it all, Pam Hilton carried a large, heavy backpack sprayer. After treating this area, we made our way – through the stoney, grass filled water and dense, brushy woods -to the DNR cabin. From there, we followed the trail through the woods back to Northcutt. I was wet, cold and exhausted. Pam Hilton checked her watch. “It’s up to you,” was what I think I spoke out loud. 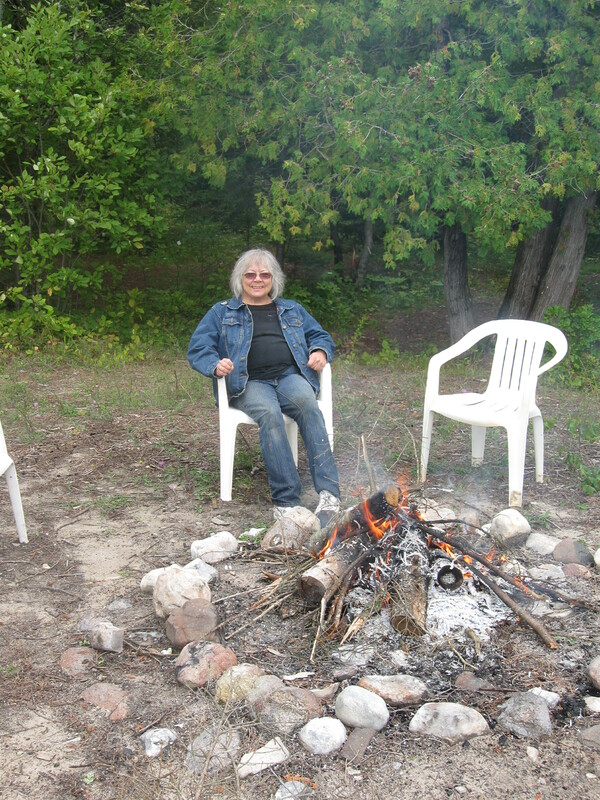 Pam Grassmick had the idea to build a campfire. It was a dandy one! I started to warm up and dry out. I started to think this was not so bad. “So…how far do you think we walked today?” I asked. “Oh…at the most, I’d say maybe three to three and a half miles,” was the reply. For their expertise, caution, patience, devotion and hard work, these people earn their pay! Volunteers deserve our undying gratitude! I returned to Beaver Island with new respect for the entire process, and the people that make it happen. Much thanks to all of you! 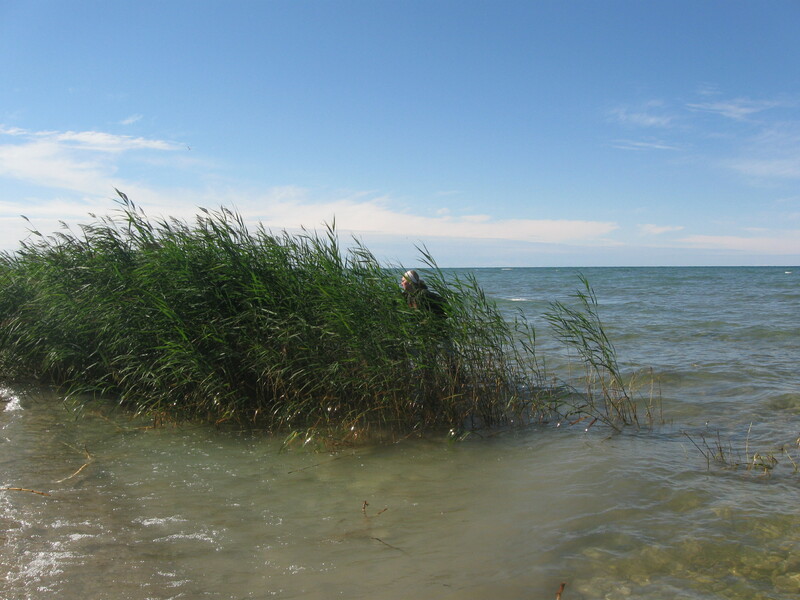 This photo, of a very healthy stand of invasive Phragmites, was taken at Cheyenne Point, right here on Beaver Island, just ten years ago! Ed Leuck sent it to Pam Grassmick yesterday, and she forwarded it to me. I was just there yesterday, at Cheyenne Point, with Pam Grassmick and three of the contractors that will be handling the Phragmites treatment here this year. There is invasive Phragmites there, still, and it will be included in this year’s treatment. This year, however, there are scattered stalks, topping out at perhaps four feet tall…certainly nothing like this high, dense stand! We are doing good work here on Beaver island, to preserve our natural wonders and keep invasive species in check. 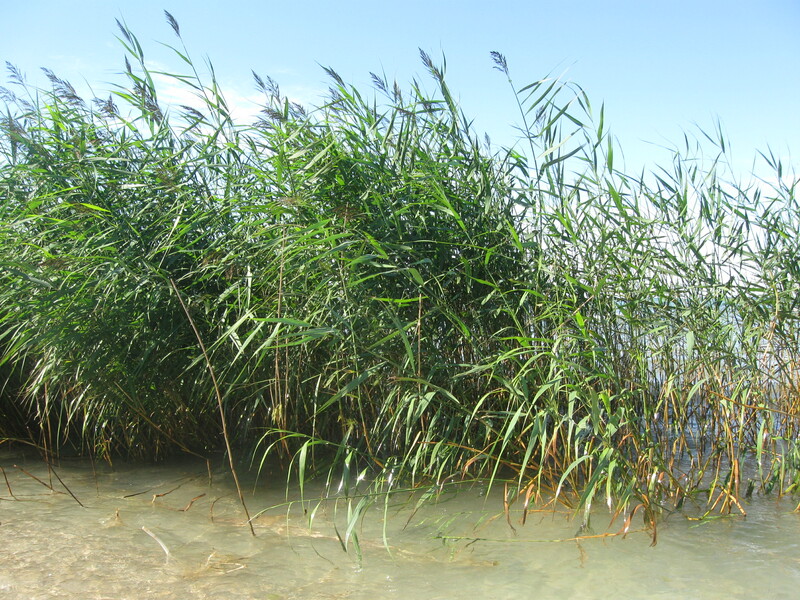 Thursday, August 28th, there will be a Public Meeting at the Peaine Township Hall, at 4PM, to address concerns regarding invasive Phragmites and its treatment. Please attend if you can. Having now received the “go-ahead” from the federal agencies, we are hoping to get some volunteers to help with treatment on Garden, High and Whiskey islands. It’s not a walk in the park, but it is a day spent with knowledgeable, caring people in beautiful surrounding, for a worthy cause. Please consider helping, if you’re able. I continue to be impressed by the community support, and donations of time and money for this ongoing project. I hope you’re all as heartened by the progress we’ve made as I am! 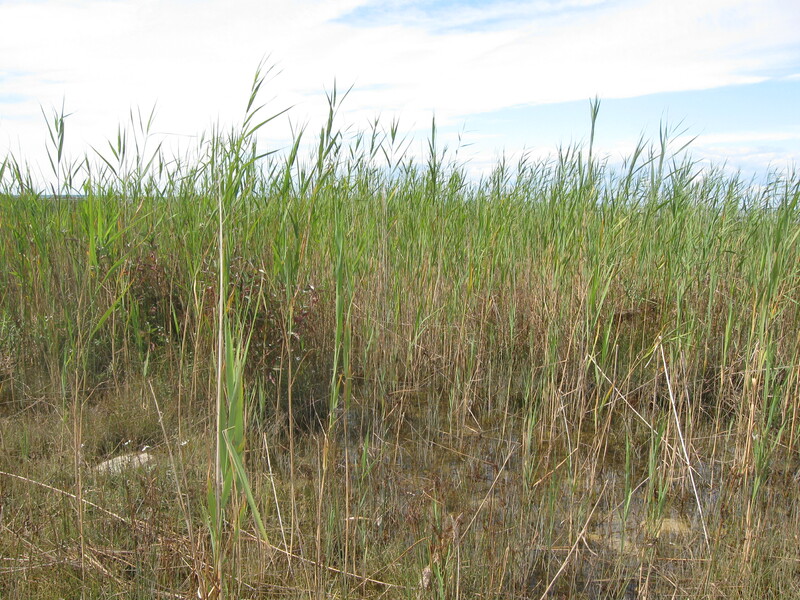 The invasive form of Phragmites, subspecies australis, is much more robust. 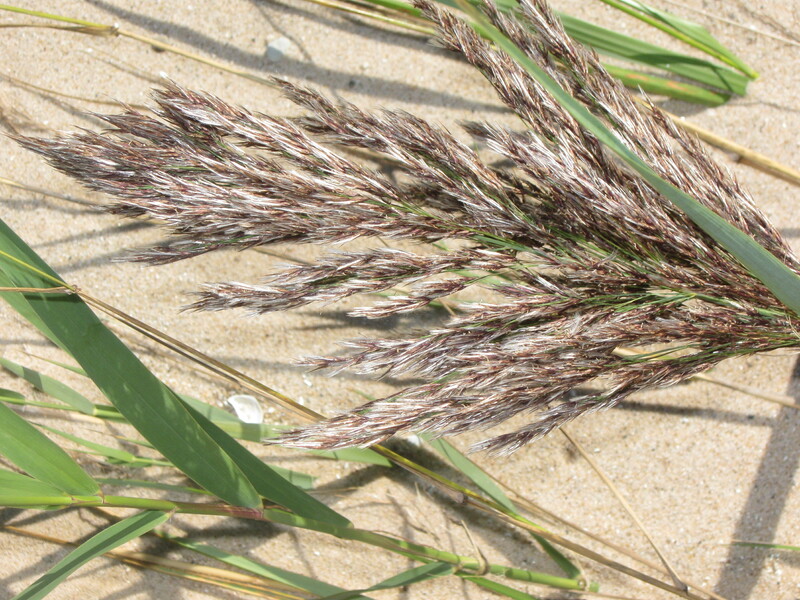 It begins growing earlier in the season and continues later in the fall than native Phragmites. It grows twelve to twenty feet in height and sends out rhizomes up to fifty feet in every direction. It forms a dense, impenetrable wall of sharp edged grass that can dominate shorelines and wetlands within only a few years. 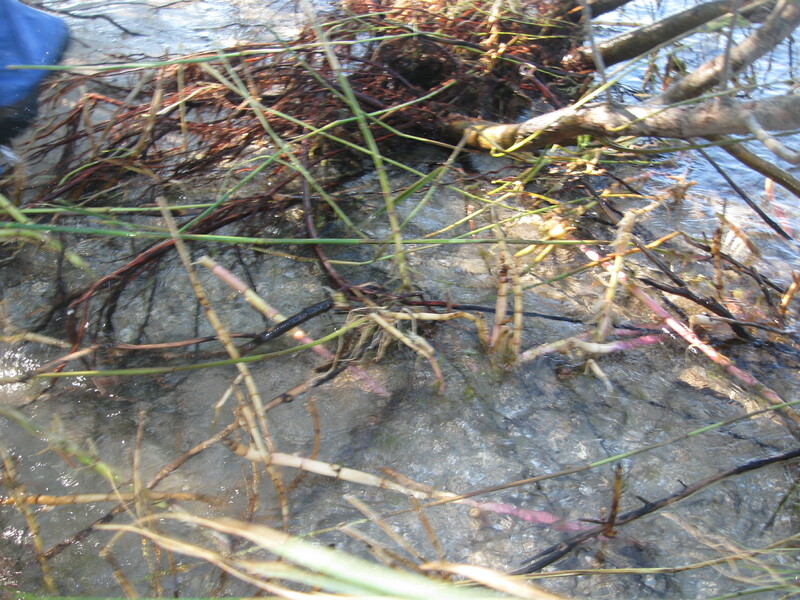 Invasive Phragmites does not provide food or shelter or protection to any animal in this part of the world. It is capable of taking over the natural habitat of many plants and animals, destroying our natural landscape. Here on Beaver Island, we have much to protect. The water that surrounds us is our shelter and our joy. Our inland lakes provide hunting and fishing and boating opportunities. 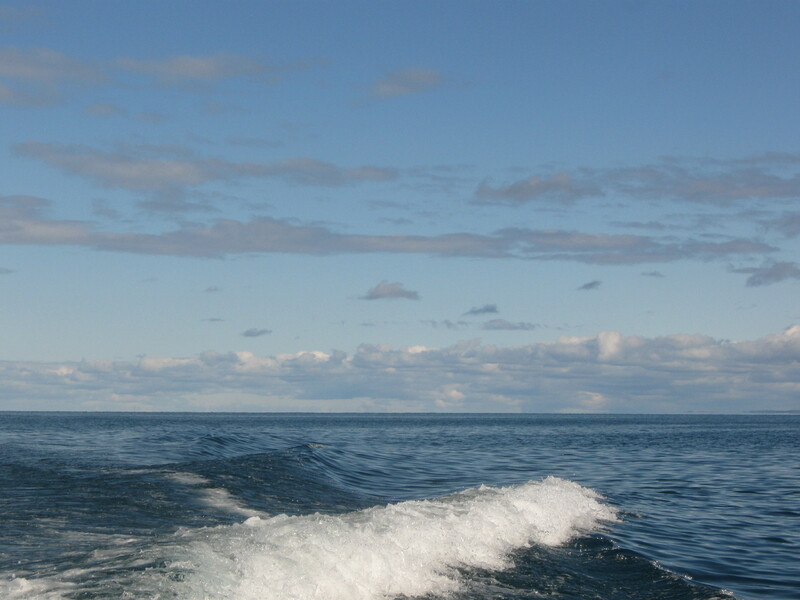 The view and water activities enrich our lives and bring tourists and visitors, which many livelihoods depend on. 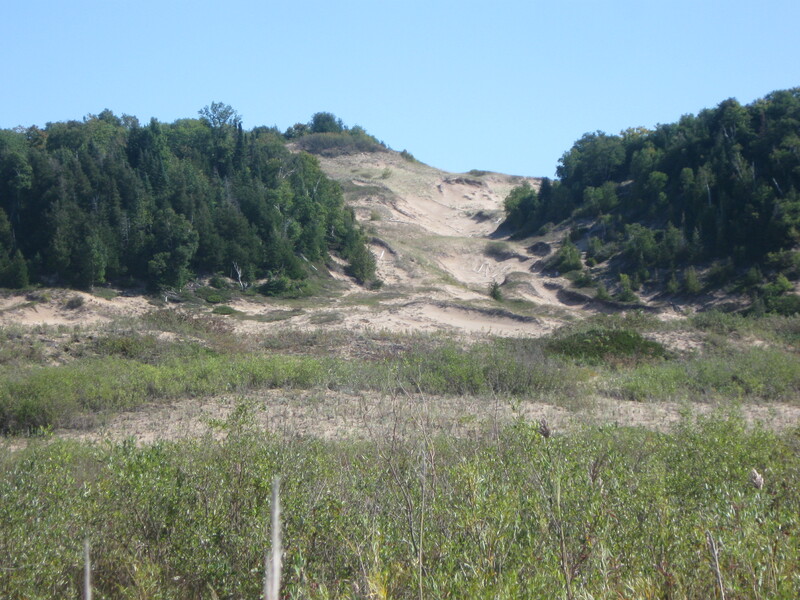 Can you picture Beaver Island without its beaches? Imagine a trip around the island without ever seeing the water! Beyond that, Beaver Island has some rare treasures. Many species – that grow in abundance here – are protected or endangered…or have been completely wiped out in other areas. 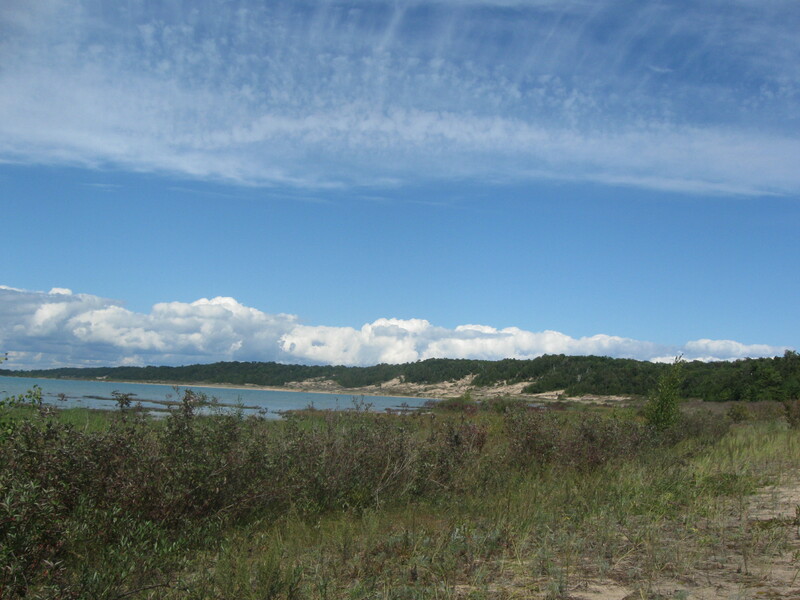 Do you know that the little Michigan Monkey Flower that grows wild at Little Sand Bay here on Beaver Island represents twenty percent of that species worldwide? Phragmites could, if left unchecked, destroy the delicate balance that allows this little gem to thrive here. We don’t intend to let that happen. At my end, we’re busy preparing for this year’s September battle against invasive Phragmites. Permits and bids and permission slips are being drawn up; resources are being gathered and accounted for; plans are being made. Your continued concern, support and vigilance in this battle is priceless!